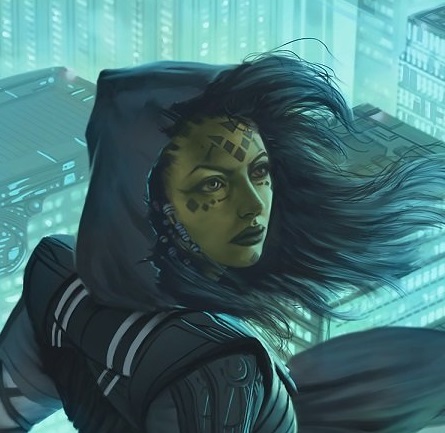 Maeti Distayre is a Miraialian-born young woman, adopted into the Mandalorian Clans as a youth after she was found drifting in an escape pod as a result of pirates having slaughtered her family and trashed their ship. Soft, supple her skin is the color of fresh borne leaves of a mint with just a few streaks of near midnight-blue here and there in the form of the hereditary tattooing. Thick unruly hair seems to want to cascade down her back in a rush of curling waves if she ever let it loose enough. As it sits, she has it confined back with hair-sticks into a bun or other times a thick braid. Lose it would probably end up hanging like a curtain of rumbled midnight iced silk past her hips. The face framed by the wild mane of hair is an exotic mix of features. Delicate and fragile her bone structure speaks of her mixed heritage, as do the large pale silvery-grey eyes. Her oddly shaded eyes can be as expressive to say the least. It is the eyes that dominate the face; slightly almond shaped and forested by lashes so thick and dark you have to wonder if they are real. Her body has the slender build of a dancer. She moves with a quiet graceful economy of motion, completely at home in her own skin. When she speaks the words are flavored of several cultures. Each one of those cultures having left little telltales in her accent. When she speaks it is almost a dance of the belly talk, showing her moods and whims to the world. She wears an odd tube style top, the heather grey color of the cloth accenting the spring shades of her skin. Perhaps she finds it works better under the armor? It buttons up the front but the top button is left loose showing off just a hint of skin. It leaves her shoulder and arms bear to the eye. Riding low at her hips are a pair of faded cargo pants that have seen much, much better days, patched in several places and others still needing to be mended. The slacks hug her lower body like an old friend loose enough to move in if she needed to. Worn spacers boots on her feet are in if anything worse shape than the slacks but look to be just as comfortable. This armor seems to be a statement of itself, originally designed to permit the wearer to function in hostile environments and even in a vacuum. The helm of this armor is attached via airtight seals and has a polarized, T-shaped visor that has come to be known for use among the Mandalorians throughout the galaxy. The visor is a navy-blue transparisteel in the middle of a buffed golden color of the central faceplate and the void black of the rest of the helm. The seals all appear a mildly lighter gray than the rest of the armor. The overall color scheme matches that of the helmet, the Void dark primary along with occasional highlights of buff gold and charcoal grey. The torso of the armor is well armored with a flat grey Mandalorian insignia on the upper left of the chest against the void darkness. Sculpted to fit a slender female ideal, there is no doubt as to the gender of the person within the armor. The shoulders have mildly flared plates articulated where the arms come down through armored sleeves and into gauntlets of the same material. Legs and hips also clad in the same black and with grey or golden embellishments combination, the armor may add as much as a decimeter to the height of the wearer, perhaps more or less. The back of the armor has a bit of a rucksack look to it. A small solid looking kit attached behind her left hip. The wrists are a bit bulked up as well, with four centimeter wide, very slender slits over the backs of the fists. These look like ports to extend blades out of. On the back of the left forearm plate rides a porta-comp. The right forearm plate has the business end of short range, but high power output blaster nozzle riding outboard to it. Clips and fasteners on the armor allow for the convenient placement of gear such as blasters or grenades. Currently, there is a H-11 rifle riding by her left thigh on a battle-sling, and a vibroblade handle jutting out of one of the boots. Anything more about the person inside... be it race or even height and weight, is likely obfuscated by the armor itself. Draped about her waist is one last bit, a kama riding low to nearly brush the backs of her boots with each stride. Life wasn't always about the battles. No, it's always been about testing myself and my skills against those battles. Some say that we worshiped War as a god. I'm more of the mind that we worshiped the honor of battle instead. This is the way of the Mando'ad. Most think that we are our armor and for the most part that's true, but we are also our people. Now me, I was born in orbit above Mirial to a family of traders and smugglers. Not that I even really remember them. IT was their last run. I was found alone in an escape pod starving and raised Mandalorian or Mando'ad to us. And thus I will remain until they are drawing me from my Beskar for the last time. Of my parents I remember very little, I've had about six so far. No-one remains an orphan if it can be helped at all. NEVER! I lost my fifth one just a little over a year after I was accepted as woman. And shortly before I joined the crew of Al'Verde Carnylla, I'm still not an orphan. Now I am a member of the Clan Distayre, and proud of it. One might almost ponder why one as dark as I am can grin and call her Ori'Vod. Well, it's because her Buir is my ba'vodu. And when she called for crew I came. Why she keeps me around still, well that you'd have to ask her. Maybe it has something to do with the box of candies and the thermal det I sent him last naming day? She went off to the glories of fighting, I went to the glories of a different sort of battle. The one of making broken toys out of the enemy’s ships. Oh, don't ever believe the osik that pilots get to never get any of the heat that those with their boots on the ground get. Heh! We're usually out there strafing and making the hard landings in the middle of those furballs of battle. Nothing gets the blood singing like the singing of the bolts around you as you have to put your ship on its belly to get the last of your crew off a dustball. Not that you ever hear many of them heaping thanks and praise anymore. But like many of the old ways they are passing. Though some of us remain, some of us will always remain. Many are the warriors who might disparage the pilot as being less than they are. Not so for the Mando'ad. When one lives by the quality of their kit, the person who can fix it and you tends to be just as cared for as one's own children. Slicer, splicer, tool jockey, splint, old fashioned. I am all these and above those even I AM Mando'ad. Pilot/Trader. If asked she might regale you with tales of the thunder of the cannons shaking the frame of her landing craft as it swooped in on a hot landing-zone. Mechanic: This is something she is at best a journeyman at. She still breaks more than she fixes. She is still in a time of drifting. Mandalorian: Maeti is of Clan Distayre. Perhaps the last of them as far as she knows. Speaks a few languages with varying degrees of fluency.